Some place flowers on the graves of soldiers on Memorial Day, and others suffer through a painful workout to honor the fallen. Josh Appel has a Memorial Day tradition. Before the barbecues, before relaxing with his family, Appel spends time doing a painful workout, one that makes him suffer. Appel is an emergency-room doctor, a flight surgeon and a former Air Force pararescue jumper. Suffering on Memorial Day is his way of honoring the fallen. On July 2, 2005, in Afghanistan, Appel led the pararescue team that flew behind enemy lines to rescue Hospital Corpsman 2nd Class Marcus Luttrell, the only survivor of Operation Red Wings. On July 4, Appel and his team returned to recover the bodies of the rest of the four-man SEAL team, including Lt. Michael P. Murphy. This Memorial Day weekend, Appel will be doing a workout that honors Murphy and the 86 Naval Special Warfare troops killed in training and combat since Sept. 11, 2001, as well as the thousands of others who have died in service of their country. The Navy SEAL Memorial Challenge, will be held on Saturday, May 24, at the Half Moon Bay Golf Links, just south of San Francisco, California, and it will consist of two parts. 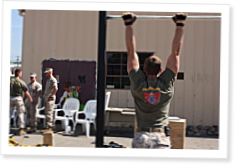 In the first, 86 participants will complete the workout Murph: a 1-mile run, 100 pull-ups, 200 push-ups, 300 air squats and another 1-mile run. At the same time, 86 players, combined into 43 two-player teams, will play an 18-hole shamble-format golf tournament on the Ocean Course. Unlike most competitions, however, there will be no winners. The focus will be remembering the 86 people who gave their lives. Appel will be there, joining in the suffering and thinking of those days in July.